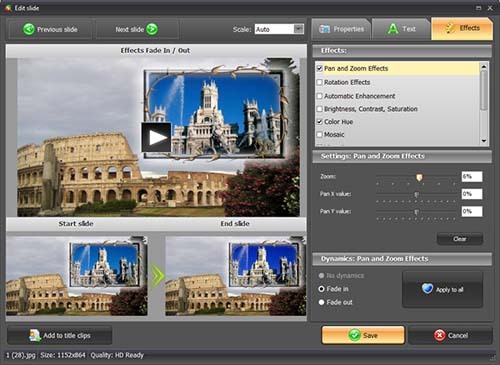 The software makes creating your own visually appealing slideshows very simple. There are several slideshow samples available for viewing on the site (they are hosted on YouTube.com) to see just what is possible. With the software, effects like pan and scan can be used to pan across an image, which gives a sense of movement in video while actually looking at still photography. A variety of image dissolves and transformation effects can be used between images, along with an added musical soundtrack, which all help to bring a photo collection to life. Take a look at the short wedding slideshow video or the Vacation in Japan video to get more of an insight as to what’s possible. Completed slideshows made with SmartSHOW can be shared in a variety of different ways. 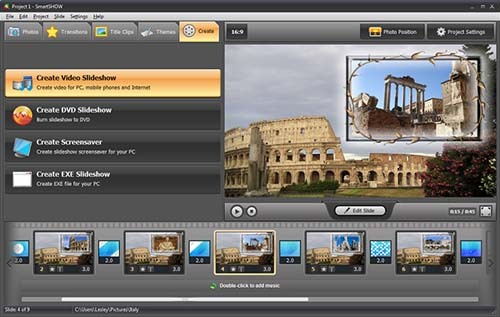 If you wish to distribute the slideshow in a corporate event or share family vacation photos, then it’s possible to burn a photo slideshow DVD complete with attractive on-screen DVD navigation menu. A self-executable EXE file can also be created that is easy to run on any Windows-based system too. If you are interested in sharing your photo slideshow with music far and wide, your project can be uploaded to Facebook, and YouTube or Vimeo video sharing sites. A flash-based video in the FLV format can be uploaded to your web site or blog for playback within a post or page. 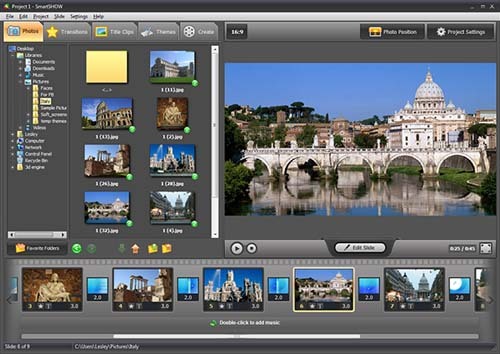 It is also possible to produce a HD quality video slideshow using the popular MP4 and AVI video formats. 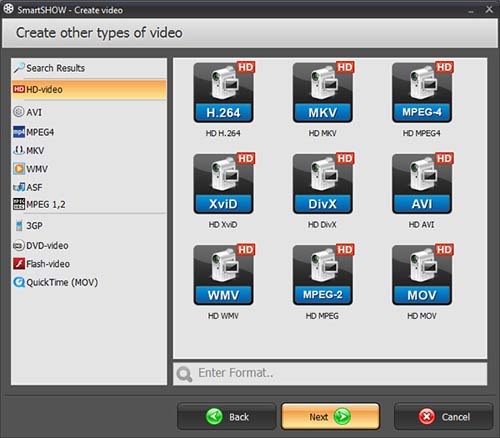 Video can also be optimized especially for the smaller screen sizes suitable for iPhones, iPod touch, iPad tablets, Android based devices and even the PSP console. These new format videos can be then be shared anywhere on the internet. One of the benefits of being able to make a video from your photo collection is that it gets around the need to be the presenter on-camera shooting a video for uploading to YouTube or Vimeo. Instead, a video slideshow can be just as effective for marketing purposes and the SmartSHOW application makes this easy to do. SmartSHOW website will give you a detailed explanation about all the features of this Windows application (compatible with Microsoft Windows Vista, XP, 7 & 8). The website contains screenshots from inside the application, video tutorials on how to make the best slideshows yourself and a FAQ to answer any questions you may have. There is a free trial download to try out the application for a limited period before deciding whether to make a purchase or not. The file is small at only 57MB, so it is fast to download even on relatively slow internet connections. The demo version is exactly the same as the purchased Standard version with no restrictions. Download the easy photo slideshow maker here: http://slideshow-maker.com/download.php. Once the demo trial period is over, it is possible to return to the official web site to purchase either SmartSHOW Standard or SmartSHOW Deluxe. These retail for $29 and $39 respectively. Upon purchase, a registration code is emailed to you and this can then be entered into the software previously downloaded. Very simple. The Standard version includes one year of software updates, whereas the Deluxe version includes an additional 130+ slide decoration themes to expand your slideshow design options, one year of free updates and highest priority technical support.